TDA2822 is a monolithic integrated audio amplifier circuit that can be configured in stereo mode or bridge mode (BTL). The IC has low crossover distortion, low quiescent current and is available in 16 pin power DIP package. The TDA2822 can be operated from a supply voltage range of 3V to 15V. The main applications of TDA2822 are headphone amplifier, portable audio systems, mini radio, hearing aid, preamplifier etc. The IC can deliver an output power of 0.65W per channel into a 4 ohm loud speaker @ 6V supply voltage in the stereo mode and 1.35W into a 4 ohm loud speaker @ 6V supply voltage in the bridge mode. TDA2822 IC configured in stereo mode is shown in fig1. The left channel input is applied to the non inverting input (pin1) of the first built in amplifier stage and the right channel input is applied to the non inverting input (pin 16) of the second built in amplifier. The inverting input of these built in amplifiers are connected to ground using separate 1000uF capacitors (C5 and C6). The amplified outputs (left and right) are available at pins 6 and 11 of the IC. The outputs are coupled to the corresponding speakers using capacitor C1 and C2 respectively. The resistor capacitor branch (0.1uF and 4.7 ohm) connected across speakers are meant for improving high frequency stability and preventing oscillations. C7 is the power supply filter capacitor. 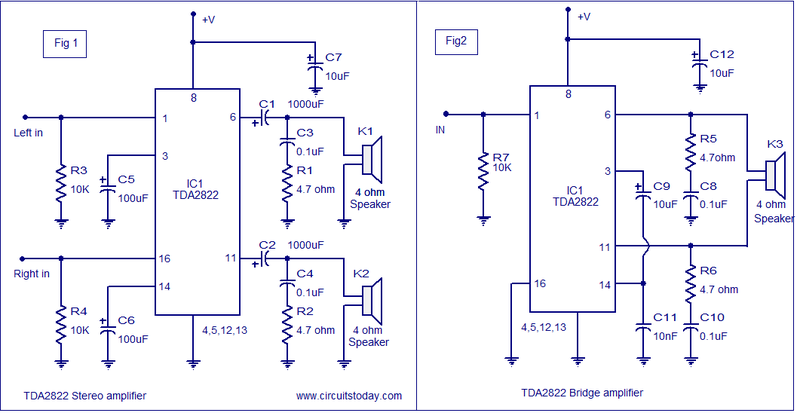 TDA2822 amplifier circuit in bridge mode. The output power of TDA2822 amplifier can be increased by using it in mono mode using the bridge configuration and it is shown in Fig 2. The audio input is applied to the non inverting input of the first built in amplifier. The non inverting input of the second built in amplifier is grounded. The inverting input of these amplifiers are grounded using the C9, C11 capacitor branch. Branches R5, C8 and R6, C10 are meant for improving the high frequency stability and preventing oscillations. Capacitor C12 is used for filtering the power supply. The power supply can be anything between 3 to 15V DC. The power supply used for this circuit must be well regulated and free from any sort of noise. Optional 10K potentiometers can be added at the input lines for controlling the volume. It is better to mount the TDA2822 on an IC base. Hi, thanks for u r reply in main operated led. now I would like to use this circuit (BTL) as a amp for my android phone, is it safe? and how to fed the stereo? and if I use a 1w 8ohm speaker. I did stereo applications. have high distortion in the output. When connecting with a logarithmic potentiometer 10k entries solved the problem. Can I fit 8 pin TDA2822M IC in above circuit?